Tennessee State University (TSU) and the University of Tennessee (UT) are Tennessee’s two land grant institutions, established under the 1862 and 1890 federal land grant acts to provide federal funds for agricultural colleges. Under law, land grant institutions are supposed to receive matching federal and state funds, i.e. for each dollar of federal funding, the state is supposed to contribute one dollar of state appropriations. Since the 1950s, TSU, Tennessee’s only public Historically Black College and University (HBCU), has not received the full land grant match to which it is entitled. While some progress has been made, the impact of this unfair distribution to TSU is felt to this day. Representative Harold Love, Jr., Ph.D., has introduced HB0823 to require the state to begin providing a detailed report of appropriations made to Tennessee’s land grant institutions annually. 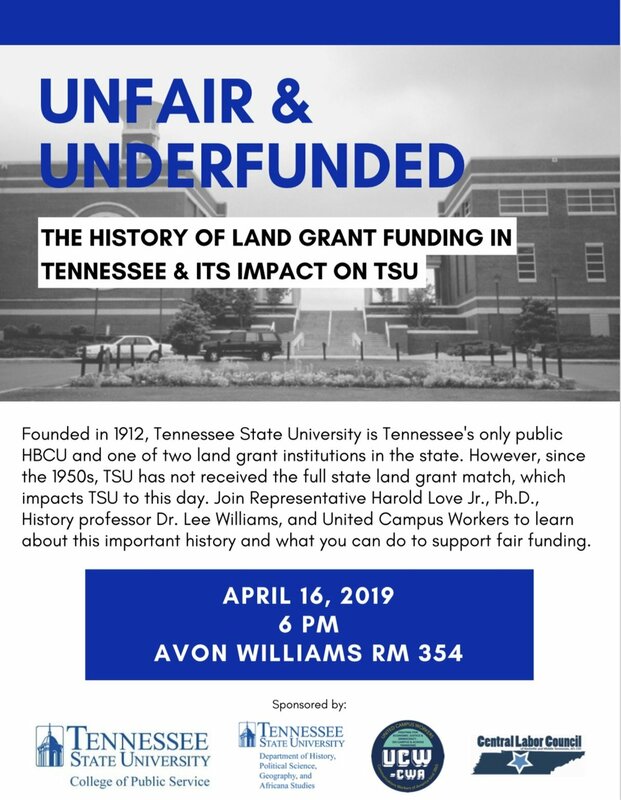 Join TSU Alumnus Representative Harold M. Love Jr., Ph.D.; TSU’s Associate Professor of History Learotha Williams, Jr., PhD., and student advocates from TSU’s Social Work Program and History & Africana Studies Programs who will present information about this issue and discuss the impact of this historical unfair funding scheme on Tennessee’s only public HBCU. Students will present ways you can help to promote Fair Funding for TSU. The event will be live streamed from the facebook page of United Campus Workers. While the TSU family is working to rectify this situation, the university needs your help. You can text TSU10 to 50155 and you will be prompted to enter card information to donate directly to the TSU Foundation, which allows TSU officials to determine the best way to utilize funds given. You can download the Advocacy Toolkit from the event by clicking here. You can download the Agenda from this event here. You can download the PowerPoint Slides from this event here. Review a report on this issue here. This event is sponsored by TSU’s College of Public Service, TSU’s History, Political Science, Geography, and Africana Studies Department; United Campus Workers; and the Central labor Council of Nashville & Middle Tennessee. This event is free and open to the public. Parking at the Avon Williams Campus (330 10th Ave N, Nashville, TN) is free in the evenings. Overflow parking is also free in the evenings at the state employees lot across the street.